Two calorimeter arrays have already measured cosmic x-rays as part of a joint undertaking of the University of Wisconsin-Madison and NASA's Goddard Space Flight Center known as the X-ray Quantum Calorimeter (XQC) project. Carried aloft on a sounding rocket (see accompanying photo), the instrument observed the diffuse soft x-ray emission from a large solid angle at high galactic latitude for 240 seconds in 1996 and again, in March of this year, with improved hardware. The spectrum shown here is from a very preliminary analysis of data from the 1999 flight. 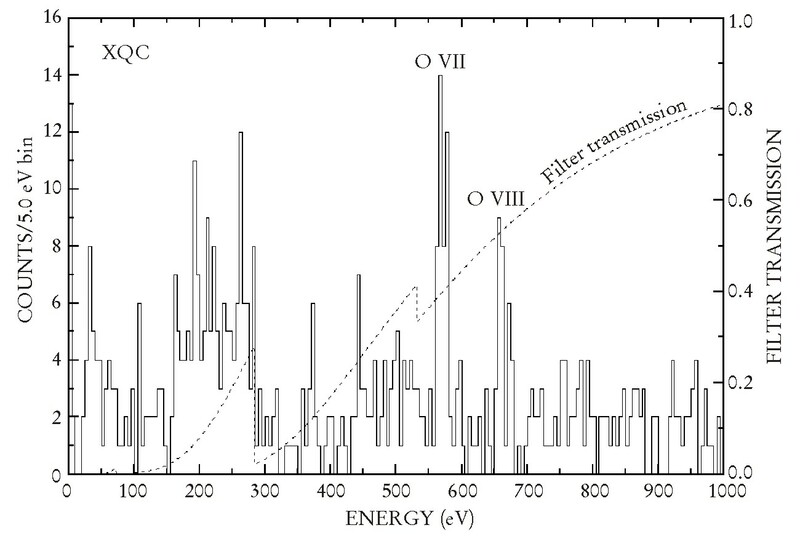 Although the data await further, improved analysis, lines are clearly seen at the energies of highly ionized oxygen. 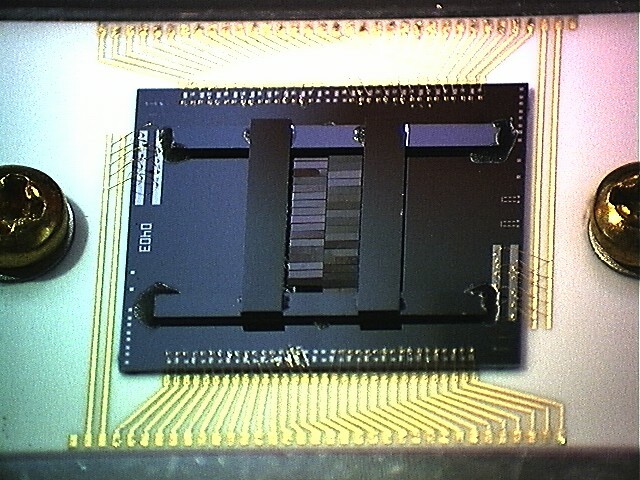 The 36-pixel array, consisting of ion-implanted, micromachined silicon thermistors and mercury telluride thermalizing x-ray absorbers, was operated at 60 mK and had an energy resolution as good as 5 eV in the 0.05--1 keV band. The ongoing XQC project, led by one of us (McCammon) at Wisconsin and by Andrew Szymkowiak and Scott Porter at Goddard, serves as a testbed for new calorimeter technology optimized for soft x-rays. The X-Ray Spectrometer (XRS) calorimeter instrument, scheduled for launch as part of the Japanese-US x-ray astronomy satellite ASTRO-E in early 2000, has an array of 32 microcalorimeters at the focal plane. The arrays for XRS, like those for XQC, were developed and fabricated at Goddard and consist of silicon thermistors and mercury telluride absorbers. Typical resolution is 9--10 eV at 3 keV and is 11--12 eV at 6 keV --- an order of magnitude better than a silicon x-ray ionization detector. This broad band (0.4--12 keV) instrument was developed jointly by a Goddard-Wisconsin, team led Richard Kelley and a Japanese team from several institutions led by the Institute of Space and Astronautical Science. During its two years of operation, XRS will apply the power of x-ray spectroscopy to unravel the mysteries of the hot and energetic universe.